It's official. Outside Lands, going down August 10-12, 2018, in San Francisco's Golden Gate Park, has not one but TWO female headliners dominating its lineup this year. Huzzah! Last week, we gushed about Ranger Dave's #OutsideLandsClue hinting that Janet Jackson would play the festivals 11th year – we just didn't know where she'd fall on the lineup. Thankfully, today, our suspicions were confirmed. 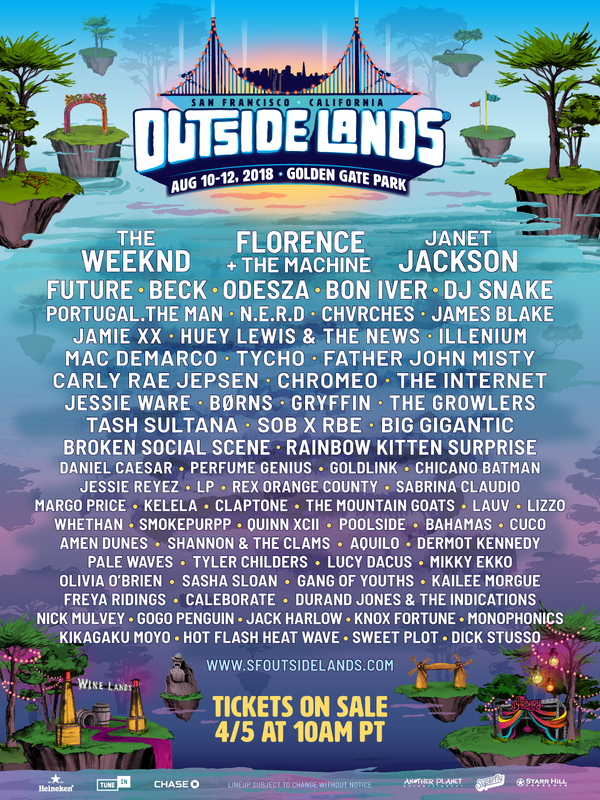 Outside Lands finally secured its first-ever female headliners in Jackson and Florence + The Machine, who join The Weeknd to top the fest's three days of music. The rest of the lineup is a delightful potpourri of pop, rock, hip-hop, and dance music – the kind of diverse array Outside Lands has always excelled at. The one left-field (but awesome) booking we're stoked on is Huey Lewis & The News. What?! Take a peek below. Bear in mind this is just the musical lineup; the culinary lineup – which is always a major highlight of the fest – is still to come, as is the comedy lineup, for which Outside Lands is also well known. Get even more hyped on the Outside Lands lineup with our Spotify playlist below.